Before we get started, just a small reminder. Does anyone remember back in 2005 when the Xbox 360 first came out? There was a picture on the box of an upcoming Indiana Jones game which later on became Indiana Jones and the Staff of Kings. It was available on the Wii, PSP, Nintendo DS and PS2. It never showed up on the Xbox 360 nor the PS3. To this day, I am still waiting for a decent Indiana Jones game on console. Until this happens, I will be content with the Uncharted and Tomb Raider games. Not that either are bad but they owe part of their existence to the Indy franchise. I would love to see that type of game setting happen…but I digress. 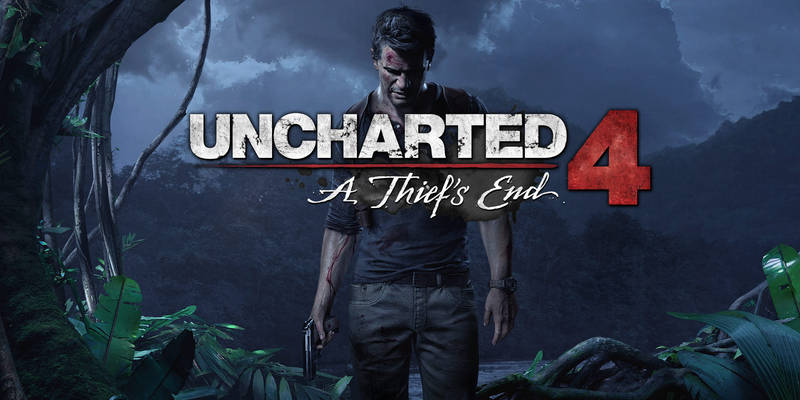 Uncharted 4’s latest iteration by Naughty Dog is a narrative that so far is probably one of the best told I have seen in a game since their last outing with The Last of Us. In this game, we find that Nate has settled down and married Elena. Furthermore, he works a salvage company and is doing ok for himself. But, this is not the whole story. We learn more about Nate and his brother, Sam’s life as foster care kids and the bond that they have. Sam has a run in with a drug lord who wants a treasure that Sam has discussed. The treasure is supposedly a pirate’s hoard worth about 400 million dollars. Furthermore to complicate things, Sam and Nate are outrunning a former partner who is also looking for the same treasure. In a way, it’s not too much unlike stories we have seen but all the same, this is a story that plays out well. Thus far, Nate and Sam’s travels have taken me to Panama, Scotland, and now Madagascar. One of the best things I like about this game thus far is that the story is told very well during the cut-scenes and with the graphics power of the PS4, the characters emote very well. Being able to see the nuances in the characters’ expressions during the story really goes a very long way into pulling you in. To be honest, the last time I have seen characters this expressive in a game was L.A. Noir. There have been many times I would wish that the cut scenes would continue but…there is a game to play. 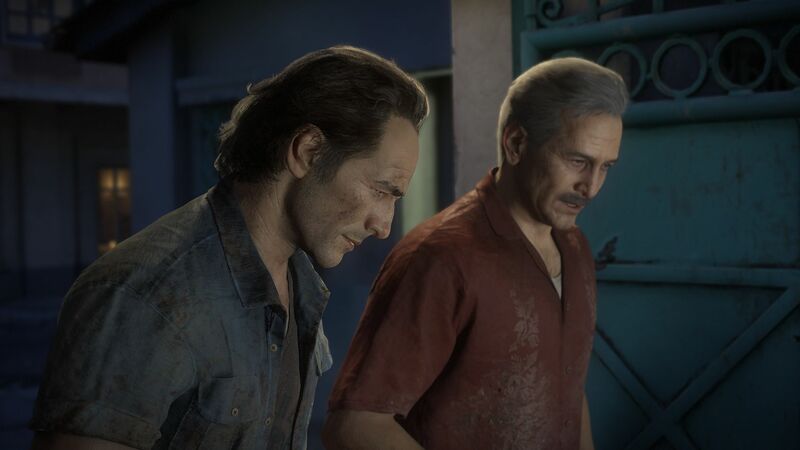 As far as the game-play itself, Naughty Dog gives us the “if it ain’t broke, don’t fix it” approach. So, just because we are playing this game on a new console doesn’t mean that they would try to give us something totally different. Moving through the environment still feels familiar if still a bit linear. They did add a few nuances to the game. On one hand, a’la Indiana Jones, you can swing from certain areas, not with a whip but a grappling hook and from Tomb Raider, there are areas win which you have to slide down in order to progress. The controls still feel familiar although at times, taking cover and using that mechanic can get a bit wonky, otherwise once you have played for a few hours, you feel right at home. Besides the graphics, which are impressive, I am also enjoying the sound stage. One of the small issues I had with the original 3 games is that nearly all the weapons sounded alike with small differences depending on what kind of pistol or rifle your character uses. This time around I noticed that nearly all of the weapons sound different and some even give you a sense of heft as you use them. Using the different machine guns one will notice how they all sound a bit unique. The FAL, AK-47 and M14 all sound a bit different. If you have been a fan of the series since the beginning, then getting this game is a no brainer. The puzzles are not as difficult as some of the ones in Tomb Raider are, but the story here is very immersive. I can’t wait to see how this turns out for Nate. Graphically speaking, this is one of the best looking games at this moment. I have not had a chance to try out the multiplayer as I plan to do so in the next few days once the servers stabilize. But, just for the story itself, this has been worth the 5 year wait.